Compared to traditional salsa, guacamole sometimes requires a more adventurous palate. Its texture and green appearance may raise an eyebrow at first, but guacamole contains a wealth of essential nutrients not found in more processed alternatives, such as mayonnaise. Once you understand the nutritional profile of guacamole, you may decide to use it to replace less-healthy options. The staple ingredient of guacamole is the avocado fruit, responsible for the signature green color. The other ingredients can vary, but often include items like lime juice, garlic, white onion, Serrano chillies, tomato and salt. At first glance, the fat content of guacamole may surprise. Guacamole can contain 15 grams of total fat per ½-cup serving, depending on the variety. You may wonder how something with only fruits, vegetables and spices has so much fat. The answer is in the avocados. One serving of an avocado, or one-fifth of an entire avocado fruit, contains 4.5 grams of fat. Although this number may seem high, keep in mind that most of the fat is in the form of healthy monounsaturated fats. Guacamole is not known for its high carbohydrate content. 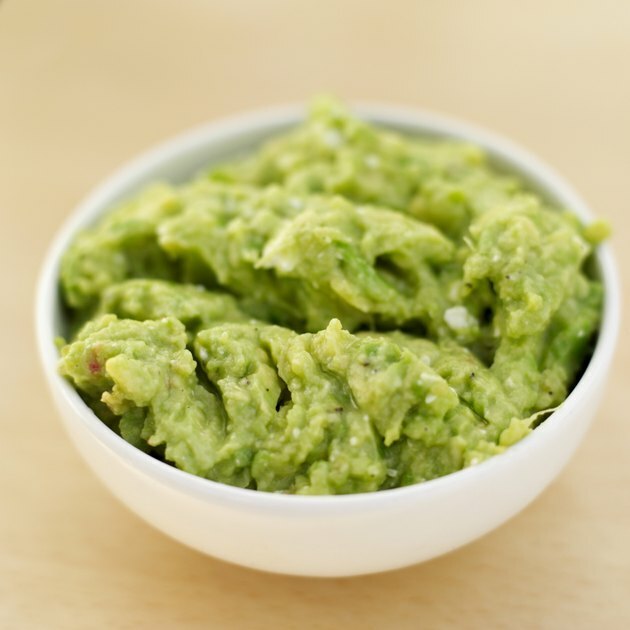 One ½-cup serving of guacamole typically contains about 12 grams of carbohydrates. However, when you consider the carb content, you should also consider the dietary fiber that guacamole provides. When you take the dietary fiber content into account, you can calculate the net carbs, which are the carbs that actually increase blood sugar. Guacamole contains 8 grams of fiber per serving. Subtracting the 8 grams of fiber from the total 12 grams of carbohydrates leaves you with only 4 grams of net carbs. Calories in the scientific world are a measure of the energy within a food and come from fat, protein and carbohydrates. Because guacamole is a significant source of fats, it is associated with a similarly large number of calories. One ½-cup serving of guacamole generally contains about 170 calories, with slightly more than half of these calories coming from fat. Slightly less than half of these calories come from carbohydrates, with protein being responsible for the remainder of the calories. Guacamole contains a noteworthy amount of several vitamins and minerals. Most notably is potassium, essential for the muscular and circulatory systems. Although bananas are usually the potassium poster child, one serving of guacamole, with 575 milligrams of potassium, contains over 100 milligrams more potassium than a medium-sized banana. Also not to be overlooked is vitamin C, essential for a healthy immune system, as well as vitamin A, essential for eyesight. One ½-cup serving of guacamole weighs in with 20 milligrams of vitamin C and 382 international units of vitamin A. Guacamole also provide smaller amounts of niacin, folate, calcium and beta-carotene.